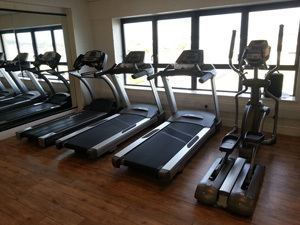 Very recently we have completed a sports & fitness installtion for Astro Active Community Centre, Enniscorthy, Co. Wexford. 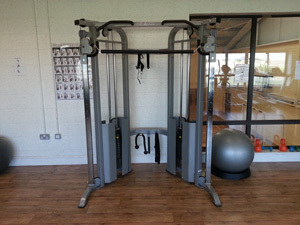 We supplied numerous fitness equipment pieces for the fitness suite, fitted main wall basketball units which allows matches to be played to National League standard and also line marked the sports hall with 6 courts. Astro Active is a community based multi-sports facility for use by those with disabilities and members of the community. The Sports Field Development Programme was launched in 1998 with the levelling, draining and reseeding of the field adjacent to our premises. This was further expanded in 2003 due to the purchase of an adjacent premises which was to be used as an indoor sports complex. The aim of the project was to provide a multi-sports facility for use by members of the community and those with disabilities in the South East. 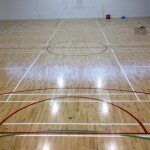 If you require Sports Hall Basketball Goals, Linemarking or Fitness Equipment information or pricing please do not hesitate to contact us, email our marketing manager; niall@fitnessfunctions.ie, visit or website www.fitnessfunctions.ie or low call us on 1890-252-856. We look forward to hearing from you. 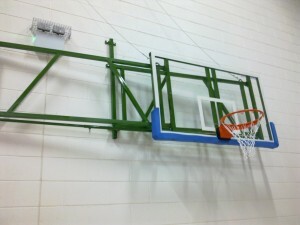 PE 30 Ceiling Basketball & Wall Mounted Main Basketball Goals. Ceiling Basketball & Wall Mounted Main Basketball Goals. As part of our series of in depth focus on Dept of Education sports equipment products, in this blog post we are looking at indoor Basketball Units. A standard new school’s PE hall will be equipped with the list of equipment in the 406 or 594 Department of Education packages. 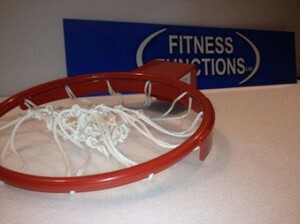 The most substantial item on the list is the PE30 Ceiling Mounted Basketball Goal. Usually 80 mm x 40 mm box section or equal approved but if span is greater than 5m a composite beam made from 2 No. 40 mm x 40 mm rails separated by 200 mm to 300 mm is required for adequate rigidity (or equal approved by the design team). When the structure is in the playing positions, the horizontal and vertical movements shall be in accordance with the FIBA regulations. Hanging steel frames made from 40 mm x 40 mm x 2 mm box section, a single arm 100 mm round tube, telescopic tubing or equal approved. If the drop length is greater than 4 m, a composite beam is required as above. The requirement to comply with I.S. EN 1270 will determine the design criteria and in particular in relation to the horizontal and vertical movement of the frame when subjected to the playing loads. This steelwork can be installed after the handing over of the building to the client as long as access to the roof girders is not made impossible by gable walls or false ceilings or other structure or fitting. In particular, the positioning of radiant panels must be carefully selected to suit the Basketball Goal design. This work should be co-ordinated between the Design Team, the Main Contractor and PE Equipment Supplier. The PE Supplier should consult the roof drawings before submitting tenders. Backboard: 1800 mm x 1050 mm made from 12 mm Perspex. Must include a backing frame to transfer the load from the ring back through the board to prevent the Perspex cracking. Must include a spring loaded ring, breakaway load at 105 kg I.S. EN 1270 Standard, which allows the ring to deflect approximately 30 degrees and return to normal when the load is removed. Safety padding, screw on type, to be fitted to the base of the board and up the sides by 300 mm. This safety device is approved for the ceiling suspended goal and imposed by the Standard – I.S. EN 360. Cable Model for high ceilings. Automatic cable winding and unwinding. Braking at 200 mm to protect against impact in the event of goal cable system falling. Fastening by safety snap hook. should be positioned so that it is possible to observe the operation of both basketball units from the switching position. Provide a four core plus earth cable from the above boxes to roof level for both ceiling mounted units. Each motor for the units has a rating typically not exceeding 250 W. The PE Equipment Supplier to supply a circuit diagram. Alternatively if the design of the hall does not allow Ceiling Basketball units we can provide the PE29 Wall Mount Basketball Goal. Made to meet NL standards the wall unit can be made to fold sideways with a locking system or stored vertically by means of a manual or electrically operated winch. These units start from €1,800 per pair. If you need us to call out to your Sports Hall or require additional, basketball sets, basketball rings or backboard information please do not hesitate to contact us. Email our digital marketing manager;niall@fitnessfunctions.ie We look forward to your email. Basketball, as one of the fastest growing sports in Ireland requires appropriate facilities. 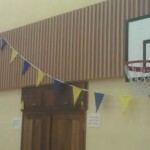 Irish Schools & Sports Centres/Halls over the last 10 years have often approach us for advice on installing basketball goals and units in their sports hall. We believe that the following 5 factors, ultimately, decide what Basketball Goals a sports venue will have. This factor plays a critical part in deciding what basketball units will best suit your venue. Some venues host national super league or International matches, but most halls will play to schools competitions and incorporate practice goals basketball. 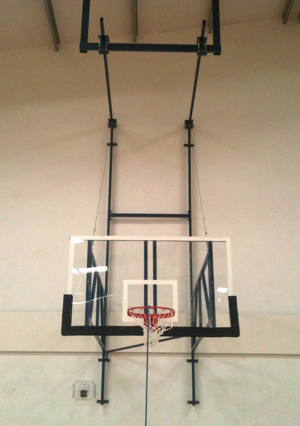 Mobile basketball goals, wall or ceiling mounted systems can be provided for each level. As a general rule “Wall” as opposed to “Ceiling” mounted basketball units are the least expensive solution. The wall units can be in a fixed play position or could be either side or vertically folding to the wall when not in use, to avoid interfering with other activities. Coming to a decision on what groups and ages will actually be playing determines the design of the units required. In a junior or national school the ring height would be set to 8′ 6″for players up to 13 years, senior level ring height is 10ft. Our goals can be fixed and made to suit one height. Alternatively, we can make the units with a lifting/lowering device to allow play at both heights. 5. Manual or electrically operated basketball system. The decision here relates to the basketball system being either manually operated via a winch system or an electronic system which will raise and lower your units into place. Naturally the manual system is the more economically option but the electronic option is the preferred choice. 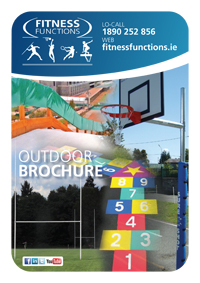 If you require need us to call out to your Sports Hall or require additional, basketball sets, basketball rings or backboard information please do not hesitate to contact us, email our marketing manager; niall@fitnessfunctions.ie or visit or website www.fitnessfunctions.ie. We look forward to hearing from you. 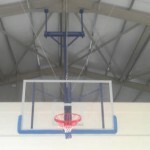 Basketball units, particularly Ceiling mounted basketball goals are usually the most costly fixed sporting element in a sports hall. As the vast majority of Irish sports hall differ in size, shape and dimensions the basketball units will need to be customised to take in the unique features of each venue. Our most recent basketball project. 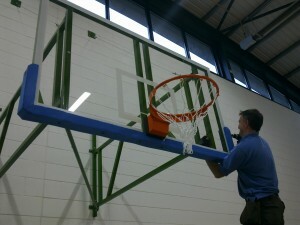 This was exactly the situation for our most recent basketball installations (May 2013) in Co. Mayo & Tipperary. 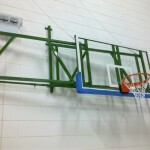 With the proper care these basketball goals will be used and enjoyed by students for years. We manufacture & install ceiling mounted & cross court basketball goals to Department of Education Specifications & Standards. 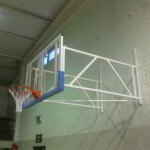 We install motorised wall mounted basketball goals complete with Perspex backboards, basketball padding, break cable safety device in sports centres & schools throughout Ireland. If you require us to call out to your Sports Hall or require additional, basketball sets, basketball rings or backboard information please do not hesitate to contact us. Email our digital marketing manager; niall@fitnessfunctions.ie. We look forward to your email. 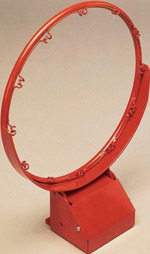 There are numerous types and styles of backboards available today. The standard basketball backboard we supply, measures 1200 x 900mm x 20mm (4ft x 3ft) and can be genuinely used either for outdoor basketball goals and also without doubt, for indoors. This is exactly the same basketball board we supply, as standard, with our Department of Education Tenders. We use these heavier duty basketball backboards on all our indoor installations for community centres, sports clubs and school basketball cross court practice basketball sets because of their durability. As we manufacture & mark these boards our prices are always competitive. Delivery is 3-5 working days from order, available drilled for standard basketball ring pattern, if requested. Weight 10kg. If you require additional, basketball sets, basketball rings or backboard information please do not hesitate to contact us. Email our digital marketing manager; niall@fitnessfunctions.ie or call 059-9152889. We look forward to hearing from you. Basketball Rings, Standard or Heavy duty…what’s the difference? Basketball Rings, Standard or Heavy duty… what’s the difference? We are Department of Education sports equipment suppliers and installers. 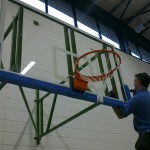 We have been supplying basketball rings to Irish Schools, Community Centres and basketball clubs for almost ten years. We are constantly asked for advice regarding what basketball rings or basketball hoops are right for particular sporting venues, facilities or schools. The Heavy Duty Basketball ring is our most popular hoop, its ideal for the majority of sports club and school use. 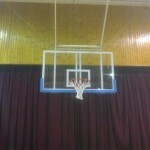 This is the basketball hoop we supply as standard with our basketball goals for the Department of Education. Its extremely durable and capable of standing up to the toughest match play conditions. 45cm Powder coated solid steel basketball ring. 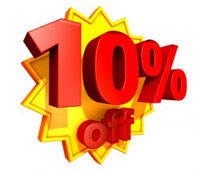 Online Shop Basketball Ring 10% November Discount. All of these basketball rings are now available from our Online Shop, customers who enter this code: bball12 (on or before 30th November 2012) will receive 10% off their basketball ring purchases. Where budgets are tight or the basketball ring will not need to stand up to serious punishment, the budget basketball ring could be a genuine option. This budget basketball ring is for light school or domestic use, where the need for a traditional ‘anti-vandal’ ring would not be required. Once again the ring is powder coated and made of solid steel. The spring loaded basketball ring is for use in practice matches, school matches or competitive matches. 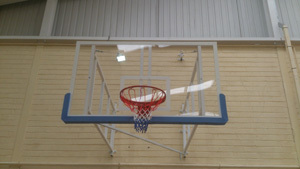 We have installed these spring lo aded basketball rings mounted onto steel frames of Perspex or acrylic backboards in almost every county in the country. If you require additional basketball rings or backboard information please do not hesitate to contact us. Email our digital marketing manager; niall@fitnessfunctions.ie or call 059-9152889. We look forward to hearing from you. Indoor Basketball Goals, Co. Longford. During the summer months we always try to complete outdoor sports installations. However given how poor this Irish summer has been we’ve recently completed indoor sports equipment projects for schools & sports centres. 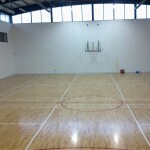 St. Marys new community centre, Edgeworthstown, Longford required a number of basketball units. The Community Centre now have 4 no. practice basketball units and 2 no. wall mounted basketball units which can be used and enjoyed for many years to come. 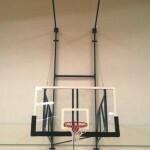 We manufacture & install practice and ceiling mounted basketball goals to Department of Education Specifications & Standards. 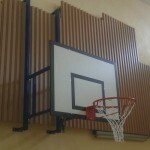 We have installed motorised wall mounted basketball goals complete with perspex backboards, basketball padding, break cable safety device in sports centres & schools in almost every county in Ireland. 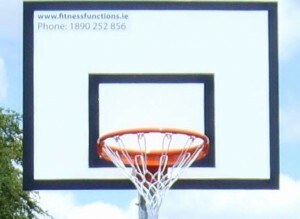 For more information on our basketball goals just email Niall Clancy, Digital Marketing Manager, niall@fitnessfunctions.ie or lo-call 1890-252-856. New Indoor Basketball for a Premium GAA Club. New Indoor Basketball for a Premium GAA Sports hall. St. Patricks GAA Club contacted Fitness Functions to install main indoor basketball units in their new multi purpose sports hall. 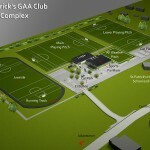 St. Patricks GAA Club have been working on their extremely impressive facility for the past three years. It’s a testament to the all the hard work and dedication of the committee & club members and surely now ranks with the premium GAA club facilities in Ireland. Sports hall indoor line marking. GAA Clubs, indoor basketball, line marking, Sports hall line marking, St. Patricks GAA Club. 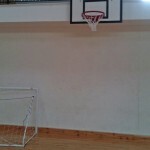 Indoor Basketball Units installed in local GAA Club. Within the last month Fitness Functions completed indoor basketball installation work for O’ Loughlin Gaels GAA Club, Kilkenny. During the summer months we had visited, made recommendations and quoted the club for an upgrade from their old style basketball backboards and basketball rings. We installed a new wall mounted basketball unit complete with Perspex backboard, break-away ring, safety padding and associated steel framework. We also upgraded their existing ceiling mounted basketball unit (photo no.2) again with a Perspex backboard, break-away ring and board padding . The club are now in the position to play competitive basketball matches, host national league basketball competition and can also rent out their hall as a league basketball venue. 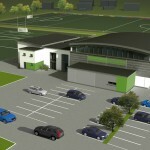 The club have made a capital investment in their sports hall which will be enjoyed by their members for years to come. Should you have any questions about wall mounted/ceiling mounted indoor units in your sports hall or outdoor basketball please email niall@fitnessfunctions.ie.